Carex® E-Z Lock Raised Toilet Seat with Arms, 15-1/2" W x 17" D x 14-1/2" H, Weight capacity: 300 lb, Added Height To Toilet: 5", Width Between Handles: 17-1/4"
The easy-to-use locking mechanism secures the raised seat to the toilet bowl. Offered with or without padded armrests. The smooth contour seat has built-in hand grips for easy handling and is lightweight and easy to clean. Armrests are not sold separately. 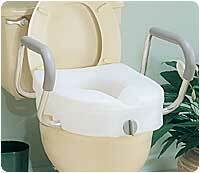 The easy-to-use locking mechanism secures the raised seat to the toilet bowl. Assists those with bending or sitting difficulties. The smooth contour seat has built-in hand grips for easy handling and is lightweight and easy to clean. Carex Economy Raised Toilet Seat 5"